Thousands are involved in car accidents each year because someone runs a stop sign. Stop sign violations can become serious when a person is injured or killed. Millions of people drive, ride or walk through stop sign intersections every day. However, there are nearly 70,000 accidents each year due to a person running a stop sign. A third of those accidents result in injuries. There are a number of scenarios that a person may find themselves in. For instance, a driver may be hit by a person running a stop sign, or the driver may hit the person that ran the stop sign. In an intersection with a 3 or 4 way stop, there may be more than two cars involved. 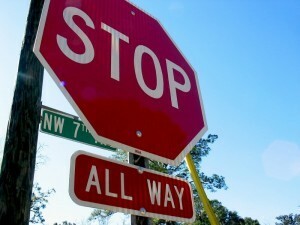 In cases of stop sign violations that result in an accident, it can be difficult to prove who is at fault. It is often necessary to set up an investigation at the intersection where the accident took place. An investigator will look at the intersection design, pavement markings and damage to the vehicles. Impatience – some people tend to be in a hurry and don’t want to take the time to stop completely or at all. Reckless driving – some drivers go through a stop sign without even realizing it. Distracted driving – some text while driving or talk on their cell phone while driving. Drunk driving – when a person is drinking while driving they are generally visually impaired and often run stop signs. It is important to contact The Hoffmann Law Firm, L.L.C. if you have been in a car accident that involved a driver that committed a stop sign violation. The streets in and around St. Louis are busy places. At The Hoffmann Law Firm, L.L.C., we are here to protect your right to compensation after a serious car accident. With more than 15 years of experience handling personal injury claims, attorney Christopher Hoffmann is well equipped to handle your car accident injury case and to share with you the things insurance companies do not want you to know. Call us today at (314) 361-4242 or fill out our online contact form to request a free and private consultation.